Here’s the finished product! Ready to play a game of Centipede! I took the design, and transferred the pieces to Adobe Illustrator to create patterns, then starting with a cardboard model, I worked out some of the assembly kinks, and came up with the finalized plans. Click through for a whole heck of a lot more photos and detail. 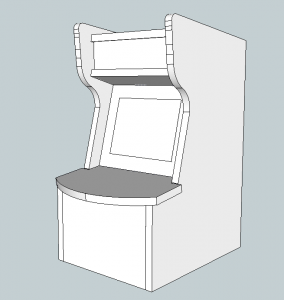 The finished cabinet is made out of a combination of 1/4″ and 1/8″ MDF, cut on a bandsaw, and sanded to final dimensions. 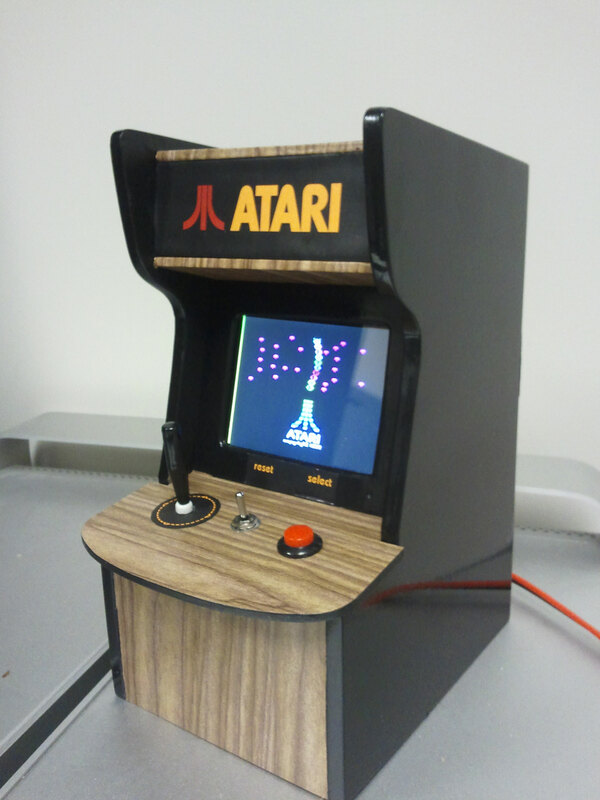 The sides were primed and painted gloss black, and the woodgrain surfaces are a self adhesive plastic laminate. I was going for the “obviously fake” look of woodgrain-printed-plastic from the 70s and 80s. 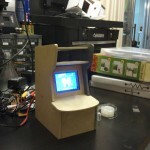 The design was scaled around the most fixed aspect of the build, the 3.5″ LCD monitor. Everything was designed to look “in proportion” to that screen size while remaining usable. 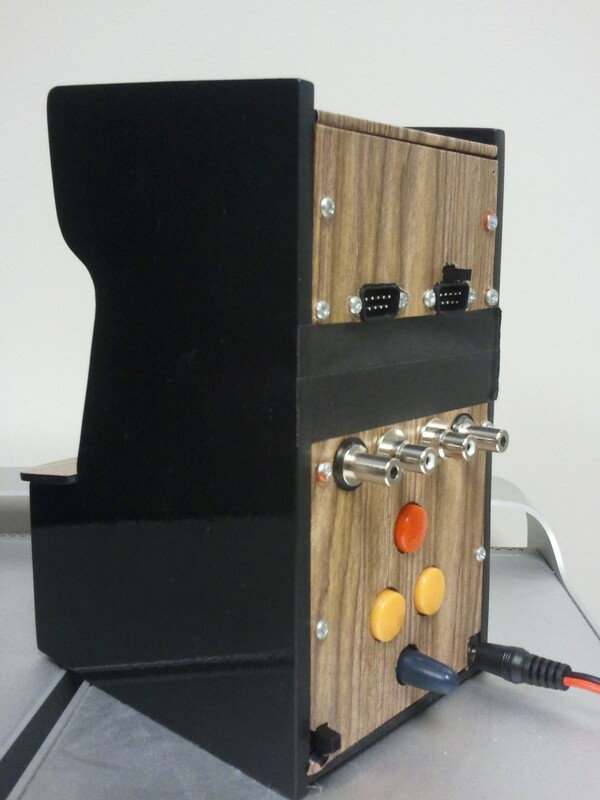 The brain is an a hacked up Atari Flashback II, hardwired into the cabinet. 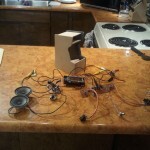 Sound comes from a gutted pair of computer speakers connected up inside, and the whole thing is powered by a 9v wall wart. 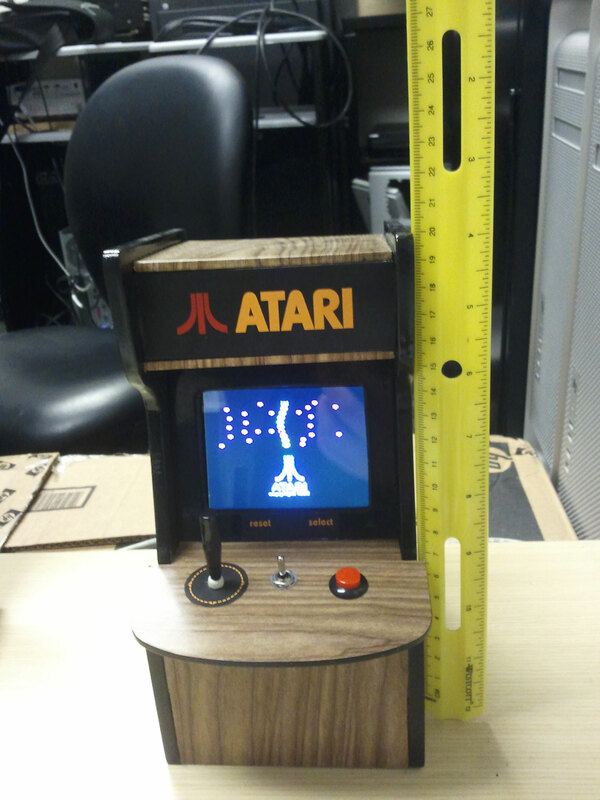 As you can see, it stands at a whopping 21cm (about 8.5″) tall, and 11cm (about 4.5″) wide. The controls are all home-made. 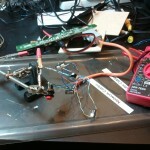 I figured out the pinouts for the Atari joystick, and wired everything up. 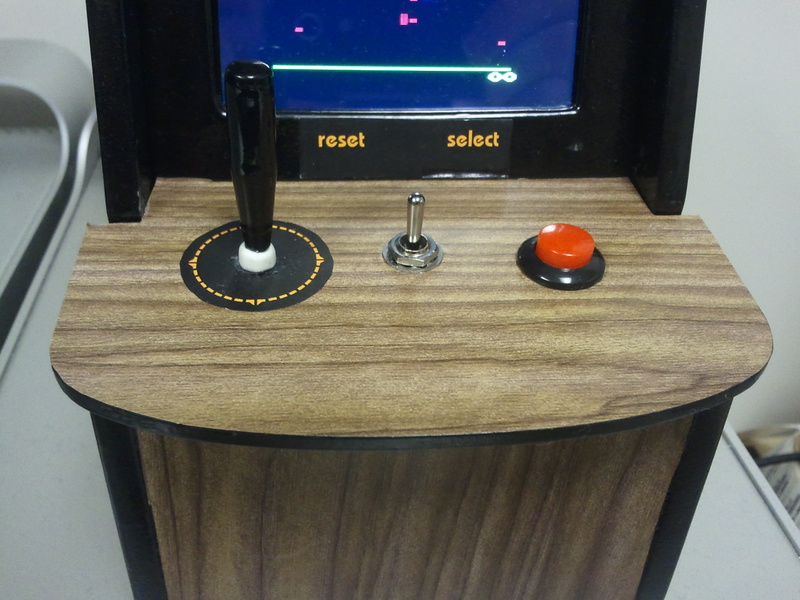 The joystick is kitbashed together from parts of a ballpoint pen, and several microswitches, the fire button is an SPST momentary button I found on ebay, and the select/reset switch is a momentary SPDT toggle switch. Press right for select, and left for reset. They’re a little out of scale, but this was necessary to preserve some degree of playability. 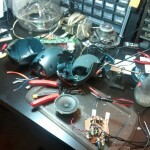 Construction and final assembly was a bit hurried, as I was getting it ready in time for a deadline. 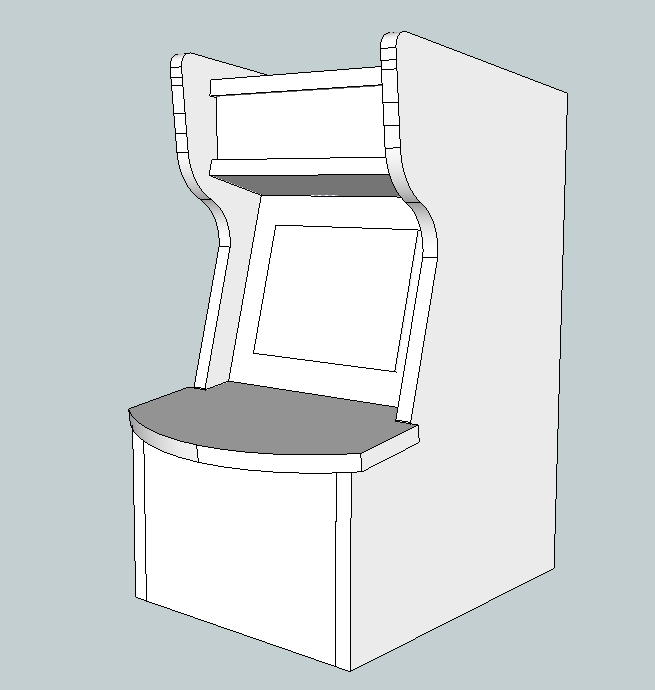 I’ve since improved construction methods, and on cabinets I’m building now, the glaring design errors have been corrected. The inside is a rats nest of wiring, and it as a heck of a job to shoehorn everything in. It all works though, and that’s the important part. I’ve debated revisiting the insides and making everything prettier, but really, at this point, I don’t think I’m going to bother. 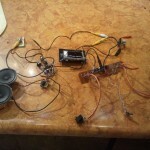 I’ll keep my mangled wiring and inexpert construction as a reminder of how I started out in building these things. Below is a gallery of some assorted construction photos, showing off the guts, and how I hooked everything up. I sadly didn’t get any shots of final assembly as I was working on a deadline, and it required both hands, my teeth, and occasionally my forehead to accomplish. Doesn’t look like it’ll all fit! It was certainly a fun project, and I’m looking forward to finishing the next one! 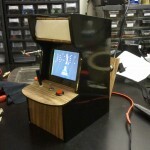 This entry was posted in Arcade, Design, Electronics, Modifications.